Cranbourne's Casey Race is a delight to recognise, view, visit and swim or exercise in. The building is architecturally designed. 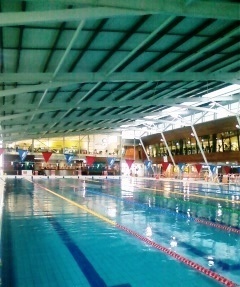 The pool is 50 metres and the gym looks out over the lap lanes, so if your not swimming, you can exercise in the gym. There's a giant water-slide and great fun pools for the children. Its a 36 million dollar swimming complex that is visually stimulating, functional and 50 metres, (which if you like to swim is the best bit about it.) Designed by Cox Architects. With post modern wood panels, a gym and even an English Cod, the centre is spacial and ideal for both lap swimming and child education and play pools. There is a great big water slide, well 2 actually. One is really easy, with rubber tubes and is dark except for the arrows. The other, which I think you have to be a bit game to take on is fast and takes you on a ride through to a big circle, from which you drop into a small water pool. Along with the water-slides and splash park, leisure pools and the 50 metre lap pool are a warm water exercise pool, spa, sauna and steam room. There is also a cafe, crèche and of course the fully equipped health club. Recycled water technology is used to maintain a sustainable water system is another feature of this award winning complex. The change rooms are spacious and clean, the staff are friendly, enthusiastic and knowledgeable. 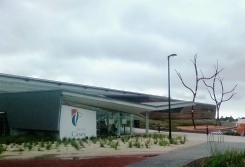 Being located a block from the main shopping centre in Cranbourne, The swimming complex has become a regional facility with people all along the peninsula happy to travel there to experience the space. Casey Race is located just in front of The Shed too. What's The Shed you might ask? Well, if you have teenagers, or are a teenager, you can either sit whilst your budding aerial exhibitionist is souring through the air or if your the one doing the skating, pad up well. Skateboarding that is. The Shed is an indoor Skateboard Park. If you do get to Casey Race for a swim and play, please, tell me if you can what type of fish is on the wood panel wall heading up to the gym. Its quite a fish. Why? Swimming is fun and good for you. Exercise helps you live better. Cost: With Peak and Off Peak pricing, starting from $4.50 for a child and $5.60 for an adult off peak.